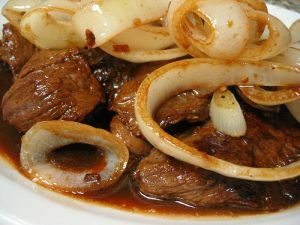 Beef with Onions is a Mongolian food recipe with green and white onions in sauce. Heat wok or sauté pan to high heat. Add 1 tablespoon vegetable oil to the pan and immediately add both green and white onions. Sauté until onions are caramelized (2-3 minutes) and remove from pan onto a plate lined with a paper towel. Wipe out your pan with a clean paper towel and add the remaining oil to the pan. Add beef and sauté until almost cooked through. Add the cooked onions, soy and hoisin sauce and stir until everything is incorporated. Bring the sauce to a simmer and cook for 1 minute, stirring constantly as not to burn the sauce. Remove from pan and serve with white or brown rice.